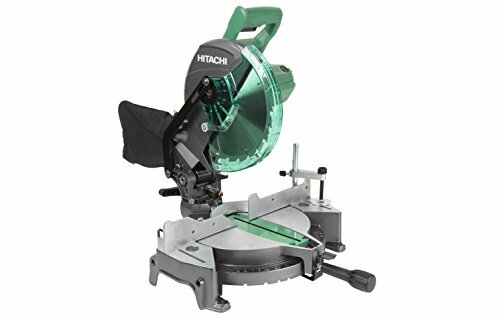 For this post, I have put together a collection of the best sliding compound miter saws currently available. These saws use the latest innovative components to meet your needs and help to ensure you do your best work. The following sliding compound miter saws will make short work of your next construction or home renovation project. 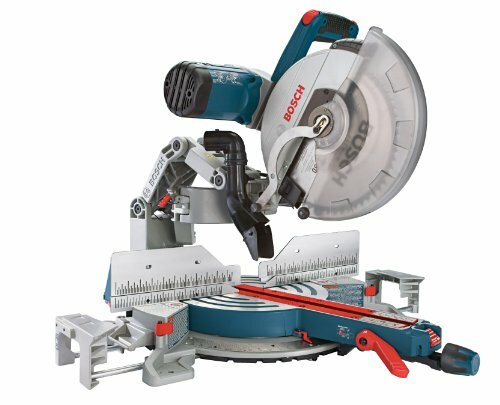 So here is my list of The 10 Best Sliding Compound Miter Saws. Powerful 15-amp, 3,800-rpm motor delivers extended power and durability. Sliding fences support crown molding up to 5-1/2 inches nested and base molding up to 4-1/2 inches vertically against the fence, while easily sliding out of the way for bevel cuts. Exclusive back fence design cuts up to 2x14 dimensional lumber at 90 degrees and 2x10 at 45 degrees. 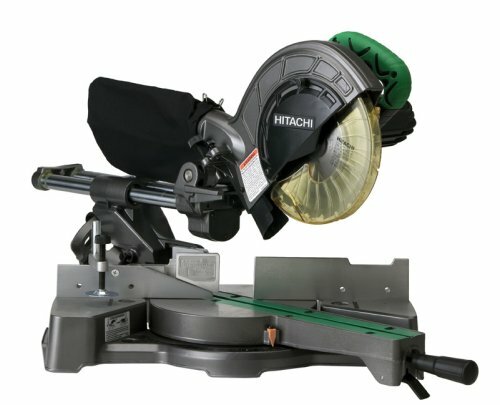 Adjustable miter detent plate allows users to quickly adjust the saw to maintain accuracy. Thirteen (13) positive miter detents allow users to quickly adjust the saw to the most common miter angles, improving productivity and ensuring cutting accuracy. Large red miter pointer makes it easy to read and locate miter angles. Miters 60 degrees to the right and 50 degrees to the left provide increased capacity. Over-sized, easy-to-read bevel scale makes bevel angle adjustments accurate and easy. Heavy-duty aluminum base with tall ribbing provides rigidity and strength. Features a smooth cutting motion, accurate performance and a space-saving design of the Bosch-exclusive Axial-Glide System. Soft-grip ambidextrous handle along with a combination dust chute and vacuum adapter add to user comfort. Large cutting capacity, easy-to-read bevel and miter scales with detents at common angles, and easy-access upfront controls. Designed to create smooth cuts and ensures that the user has complete control over the saw's cutting action. Flide system offers wider cross-cuts, enhanced alignment and smooth glide for the life of the tool. Axial-Glide doesn't use a traditional rail setup, so this saw takes up to 12 inches less workspace. 15 amp motor delivers no-load speeds of 3,800 rpm for quick, accurate cuts in many materials. 14-inch horizontal capacity, a 6-1/2-inch vertical capacity for material against the fence or base, and a 6-1/2-inch nested crown capacity against the fence at 45 degrees. Two sliding integrated base extensions that provide adjustable support for materials measuring up to 40 inches long. Squarelock quick-release fences offer easy, precise alignment. 0-52 degree miter angle range to the right & left for increased flexibility. Thumb actuated positive stops for quick miter adjustments. 24.2 lbs to facilitate maneuverability and easier transport. Dust collector attachment included to minimize airborne particles. 15 Amp motor delivers high power for the toughest cutting jobs. Large table for better material support with vice clamping system to secure work piece. 15 Amp motor generates a no-load speed of up to 5,000 RPM for making crosscuts and miter cuts with ease. 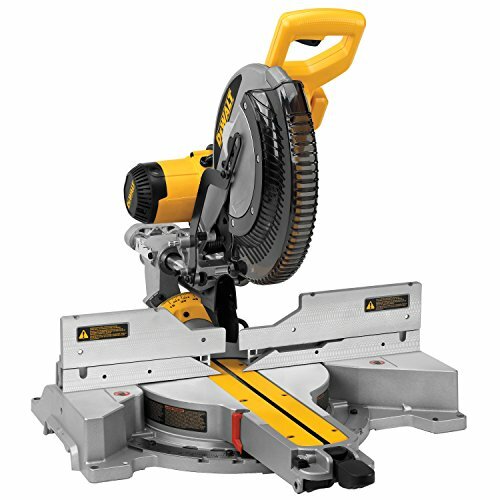 Whether you're cutting baseboards or crown molding, the 10-inch double-bevel sliding compound miter saw provides quick, accurate cuts to complete the job. 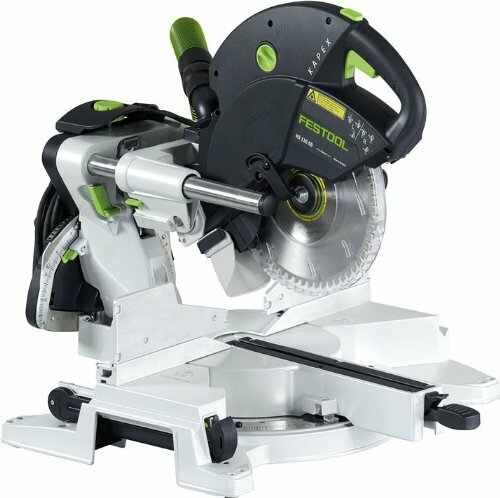 Thanks to a powerful motor, an easy-to-adjust cam-lock miter handle, convenient miter and bevel stops, plus a tall fence for accommodating oversized moldings, this saw is ready for a range of crosscutting and miter cutting applications. Tall sliding fence for work with crown and base moldings. Easy-to-adjust cam-lock miter handle delivers quick and accurate miter angles, and features a convenient detent override, which allows you to adjust the miter setting without the saw slipping into the miter detents. Miter capacity--0 to 60 degrees to the left and 0 to 52 degrees to the right--adds versatility. The tall fence supports 6-1/4-inch crown molding nested vertically, as well as 6-inch base molding set against the fence. The fence slides out of the way easily when it's time to make bevel cuts. Stays compact thanks to its sliding saw dual horizontal steel rails, which feature an innovative clamping mechanism and linear ball bearings for increased accuracy and durability. 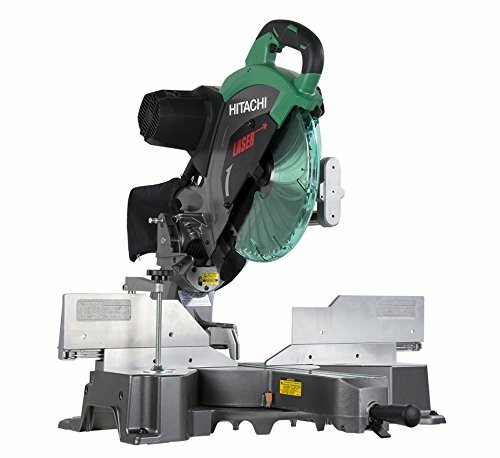 The new Hitachi C12RSH2 sliding dual compound miter saw is equipped with a compact slide system that requires zero rear clearance. Fixed rail system allows the saw head to smoothly glide along the fixed rails, eliminating the rear clearance that other sliding miter saws require. Compact slide system decreases the footprint of the saw by up to a foot saving you valuable real estate in any shop environment. The saw also features all new tall sliding fences that allow you to cut much larger material, while easily sliding out of the way when making bevel cuts. Easily adjustable tool-less laser marker allows even the most novice users to make perfectly accurate cuts. Engineered to be lightweight and compact, the KS 120 is the perfect saw for the workshop or the jobsite. 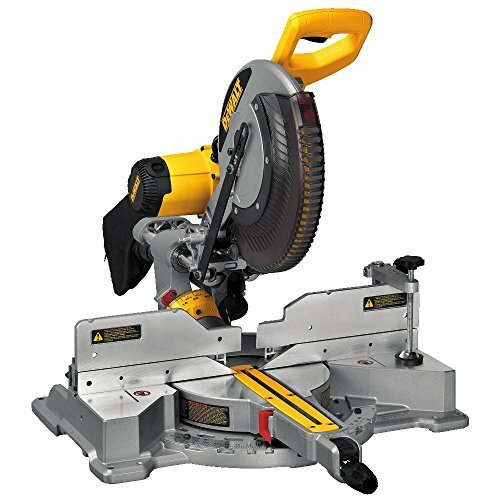 Effective dust extraction, precise cuts, easy adjustments, and quality components are some of the features that should make this saw the number one choice of professional tradesmen. Features a rail forward design which increases precision and creates a compact footprint while preventing head play for accurate cuts. Easily align cuts from the left or right side using the dual lasers. The lasers clearly define the material which will be removed during the cut. Micro-adjustable bevel angle with up-front rotary knob. Large bevel scale and fine pointers make it easy to set precise bevel angles. Dust extraction up to 91% with behind the cut dust hood and pivoting 36 mm hose. 15A 3,600 RPM and offers a new precise miter system. Machined base fence support for optimal accuracy. Cam lock miter, detent override, bevel crown stops. Left and right with a crown capacity of 6-5/8". 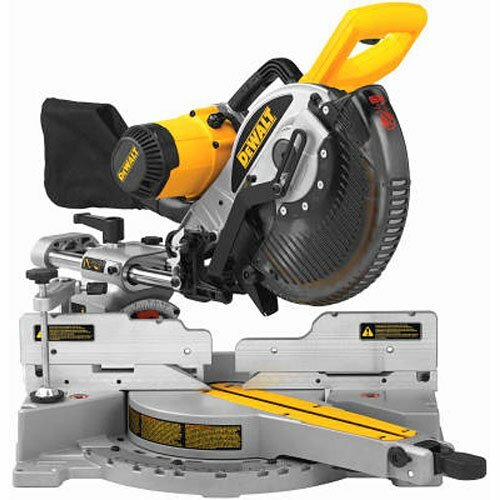 DW7187 adjustable miter saw laser system included. Lightweight, portable and slicing seamlessly through thick materials. 4,800 revolutions per minute, no matter which blade you slip onto the collar. Uses smaller, easy-to-maintain blades than larger models, but still delivers the reach to spin through boards up to 12 inches wide. 15.0 Amp motor that delivers high torque and speed. Laser Trac not only gives you an accurate cut line, but doesn't ever run out of charge. Aluminum construction is durable and easy to move. 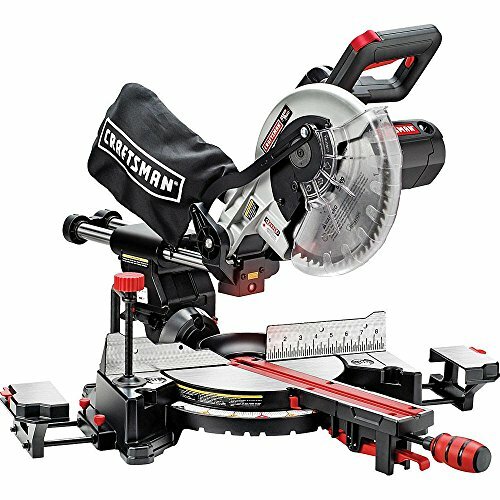 Features a powerful 9.2-amp motor that generates a no-load speed of up to 5,500 RPM for making crosscuts and miters. Electronic speed control ensures consistent RPM throughout the cut, so you get smooth, precise, controlled cuts each and every time. Thumb-actuated positive miter stops allow for simple miter adjustments at the most common angles: 15.0, 22.5, 31.6, and 45.0 degrees to the right or left. Bevel range of 48 degrees to the left and five degrees to the right, the Hitachi C8FSE provides gorgeous bevels on the first try. Linear ball-bearing slide system and pivoting fence allow for accurate cutting of large workpieces up to 2-9/16 inches high and 12 inches deep. Includes a dust collector that minimizes accumulation of dust and particles in both your workspace and the saw's interior components, keeping your jobsite clean and prolonging the life of the tool. Weighing just 31 pounds is the lightest tool in its class. Compatible with Hitachi's UU610 and UU610CZ Universal Work Stations. Large cutting capacity in a compact size. Ideal for wide Crown and base moldings. Lightweight for transport from storage to worksite. Cuts up to 2" x 8" at 90°, 2" x 6" at 45°. Lightweight design, under 24 pounds. Powerful 9.0 amp ball bearing motor. 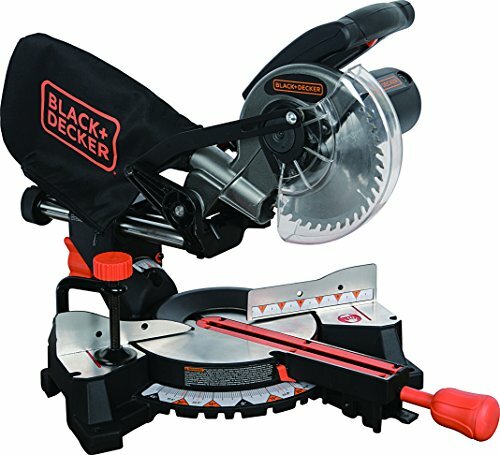 I hope this list of the best sliding compound miter saws was helpful.